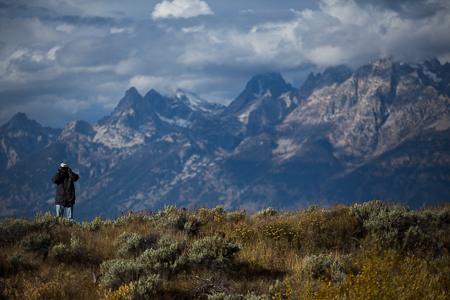 Grand Teton is a special place in the autumn time. 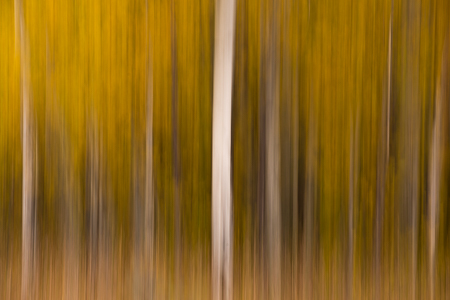 The aspen leaves change from green to yellow, gold, and orange as the days begin to cool and the sun arcs closer to the horizon, painting the landscape in pleasant rays of light. Our group of nine met for orientation in the lobby of the Lexington Hotel in beautiful Jackson, Wyoming. We went around in a circle introducing ourselves to one another and finding out what everyone wanted to get out of the workshop. A few folks mentioned that they wanted to get a good shot of a moose. The pressure was on for Scott and I to deliver, but we were confident in our moose-finding capabilities. After orientation it was time for bed, because we had an early rise ahead of us the following morning. 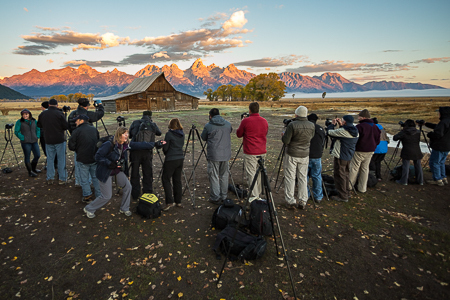 Six-thirty came way too early, as it usually does, and eventually everyone piled into the van and we made our way to the Multon Barn on Mormon Row to catch first light. The sunrise was cold and weak, to put it nicely, but what would be the fun in photography if we got nice gold and pink light every time we went out? After confirming the sunrise was going to be a bust, we headed to the tiny town of Kelly to get coffee and bagels, where we would rebuild morale with caffeine. 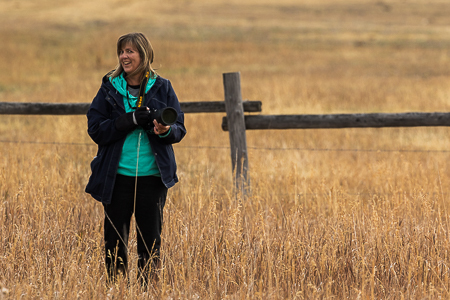 Scott and I had seen a young bull moose in the Gros Ventre campground a few days before the workshop had started, and since we were already in the area, we decided we would give it a shot with the group. Before we reached the campground parking area, we had already spotted a moose. 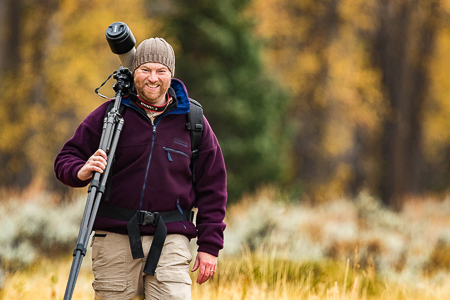 Excitement grew as the group began to unload their gear and head towards a bull and a cow. The male was busy strutting his stuff, trying to impress the lady moose, while fending off his territory in case any other bulls came near. We photographed this moose for nearly an hour before heading back to Jackson for lunch and naps. After some well deserved rest, it was time to head back out again. 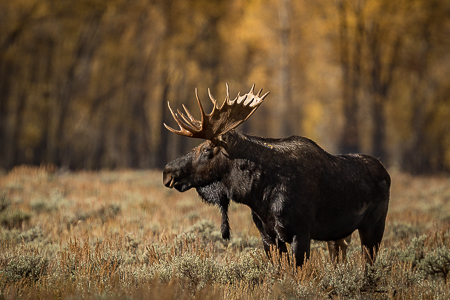 We drove down the Moose–Wilson road, where we spotted a bull moose, cow and calf near a creek. 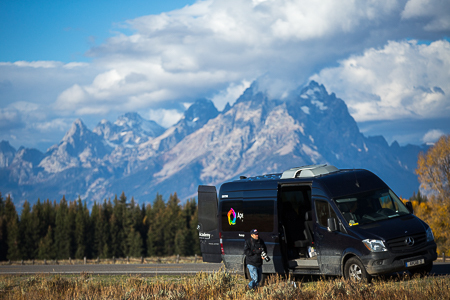 Since the park service would not allow us to exit the van, we had to open the doors and practice shooting from a vehicle. A fun and exciting experience none the less. Continuing our drive, we spotted a group of pronghorn on the side of the outer park road and decided to take a few shots. 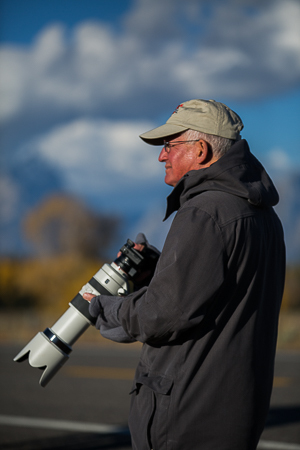 We continued our quest for big game with not much luck for photographic opportunities until sunset. The clouds had built up rather nicely to the south so we headed to Elk Flats for the last light of the day. After the sun passed the horizon, we packed our bags and headed into town. The following morning, we repeated the early bird rise and thought we would try our hand again at a Multon Barn sunrise. 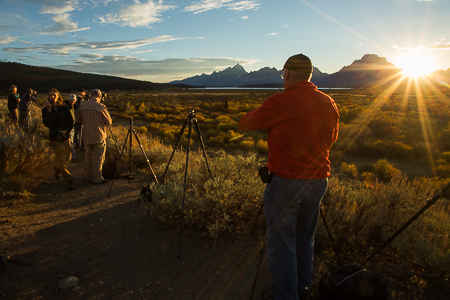 Day two was much better to us, as clouds began to build over the Grand Teton range just before sunrise, preparing themselves to catch the first rays of daylight. Success! 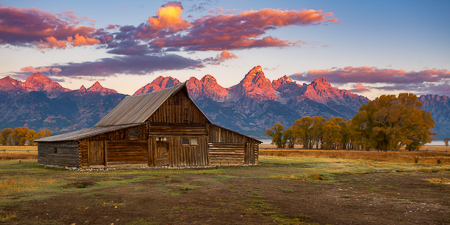 The group got their shots of the famous barn and all was good in the world. Just around the corner from the barn we noticed a small group of American bison heading towards the van, so we hopped out and took advantage of the remaining early morning light. 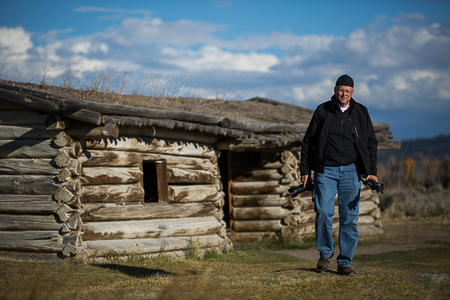 Since the clouds were looking rather spectacular, we made our way to the Cunningham Cabin to photograph the buck and rail fence that is somewhat of a famous design in Wyoming. Scott and I knew of a nice curve that would lead your eye right to the mountains, making for splendid landscape photographs. 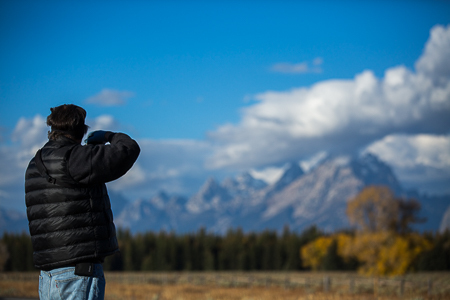 Driving up the road, we found a good opportunity to photograph some horses, with the Teton range in the background. 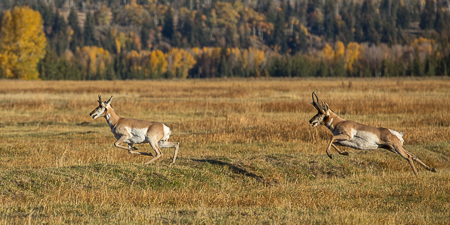 While shooting the horses, we noticed a mature male pronghorn racing through the meadow chasing a rambunctious young male. They zigzagged around long enough for most people to get a good shot before the young male crawled underneath the horse fence to safety on the other side. 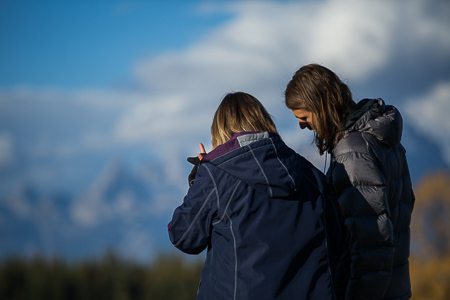 The last stop on the list of our morning adventure was Schwabacher's Landing, where the calm morning air left the beaver pond like a glass reflector of Grand Teton. 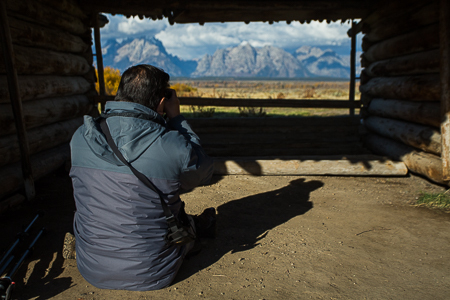 This was a perfect opportunity for a classic shot of the great national park. We got our shots and made our way back to town for some rest. The plan for the second half of the day was to game drive throughout the park and see what popped up. Along our drive we spotted a herd of bison on one side of the road and horses on the other. 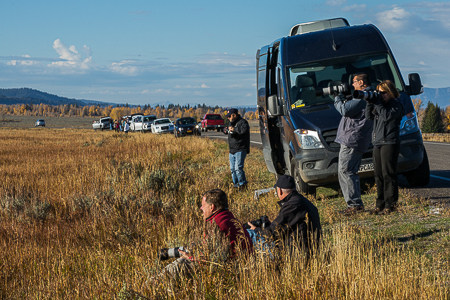 Some folks chose to shoot the bison, while others were interested in the horses. 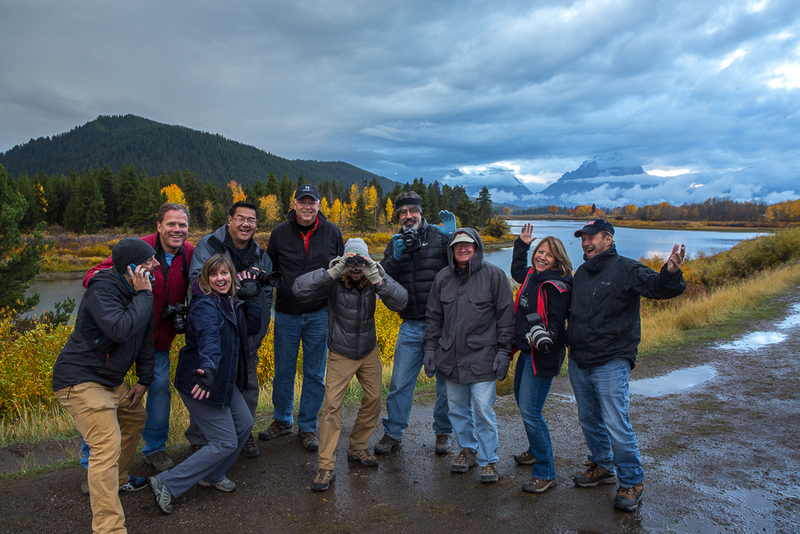 By that time the clouds were getting thick, but we thought we would try for a sunset at Schwabacher's Landing anyway. As we walked down to the landing, we discovered some playful beavers and decided to photograph them since it looked like the sunset was going to be less than amazing that evening. Once the sun went down, we piled back into the van and headed back to town for some warm food and rest. 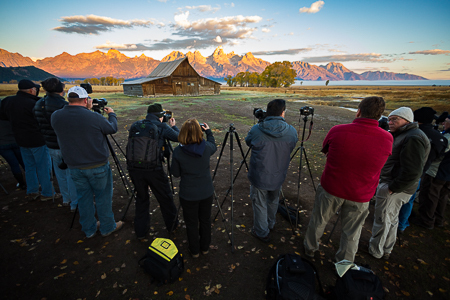 We woke up a little bit earlier on the last day of our workshop because the plan was to shoot sunrise from Oxbow Bend. Driving to the location, the clouds looked promising for sunrise but "promising" quickly faded into grim, and just when it seemed like we were out another sunrise, beautiful rays of gold fell across the land in front of deep blue storm clouds, and a rainbow appeared before our eyes. The scene was glorious and everyone celebrated the fact that we stayed in the area to wait it out. With another good sunrise under our belts, we decided to pay another visit to the Gros Ventre campground, where we spotted yet another bull moose walking along the tree line. We drove ahead of him hoping he would maintain his course. As luck would have it, he walked right past some of us, forcing us to take cover behind the nearby vehicles. Knowing we were not going to top that excitement, we wrapped up the morning portion of the day. Heading out on the last leg of the workshop, everyone was still hoping to see a bear, since we had not seen one during the course of the workshop. 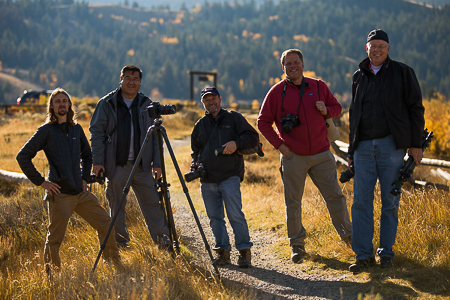 We wouldn't end up seeing a bear on this workshop, but when we looked back at the experiences we shared and photographed together, we agreed that it was another successful workshop with yet another all-star group of photographers. 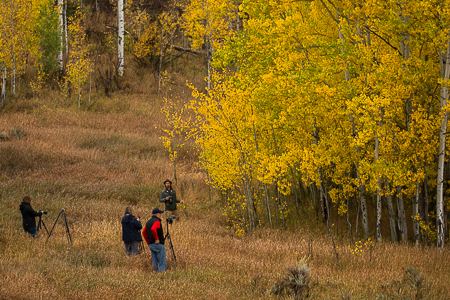 We wrapped up the day photographing a grove of yellow aspen trees and headed into town for a delicious group dinner at the Gun Barrel restaurant. We shared an evening of food, drinks, and stories before bringing the workshop to a close Sunday night. Phil, Scott, and the rest of the Aperture Academy Team!